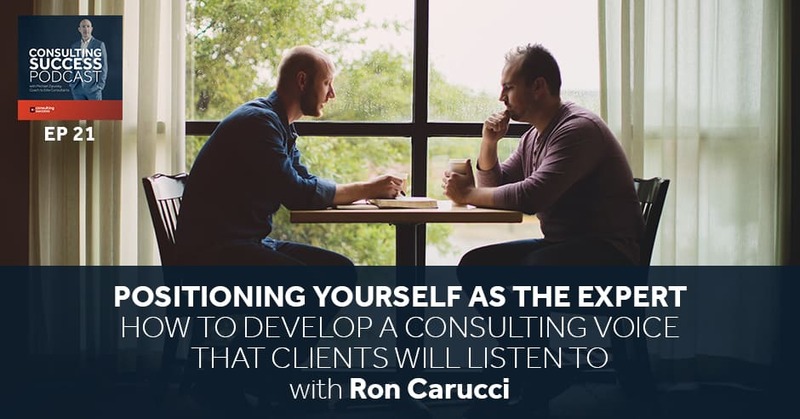 Today I’m joined by seasoned consultant and passionate leader Ron Carucci. Ron and his partners at Navalent help companies that are in pursuit of a substantial transformational change, whether it be strategic formulation, organizational design, cultural shifts, or executive leadership behaviors. His work has taken him to over 20 countries in four different continents, and he is the author of several consulting and leadership books as well as a regular contributor to Forbes.com and the Harvard Business Review. 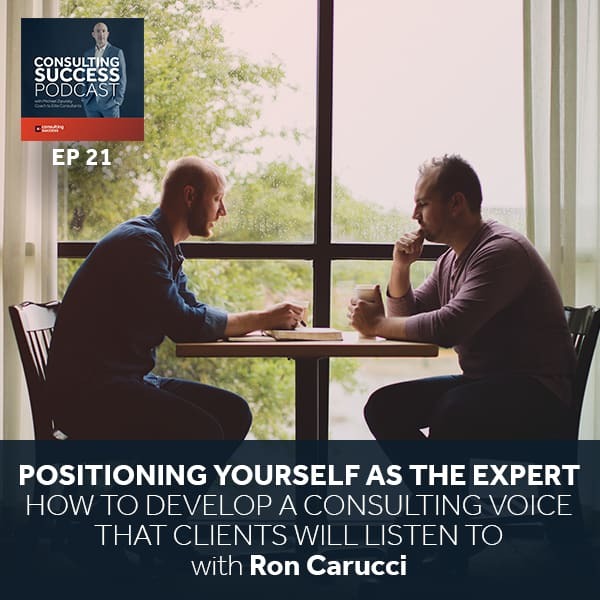 In this episode, we talk about how Ron shifted from working in an organization to working for the best ones, the ideal size of a successful consulting firm, and the effective ways to implement changes in your work so that you are attracting only the most ideal clients. Ron has over 25 years of experience, and he has worked hard to position himself as a truly successful consultant. You won’t want to miss the insights and experiences that he shares in this episode of The Consulting Success Podcast. Discipline and patience are two of the essential keys that will bring you the greater consulting success you are seeking. I’m very excited to have Ron Carucci joining us. Ron, welcome. Michael, so great to be with you. Thanks for having me. For those who don’t know you, explain what you do. I spend my days with my colleagues at Navalent traipsing the planet with leaders and executives who are in the throes of some very substantial transformational change, whether that’s a strategic change or an organizational change or some combination of those or leadership change. Somewhere at the intersection of those three domains, we do our consulting work. Our relationships usually span multiple years. It’s any combination of strategic formulation, organization design, cultural shifts and executive leadership behavior that form the basis of help we provide our clients. Were you always interested in this? Did you, when you were younger, think, “I want to build a consulting business and I want to help people deal with leadership issues and change,” or something completely different? I was doing something very different early in my career. I studied arts and it was my initial formal training. I was out working in Europe. I was over there for about three years. The company that I toured with had a contract with the State Department and the US military. One particular program we were doing at Dachau in the chapel, a very sacred and difficult place. Back in the days, I’m talking about the words ‘diversity’ and ‘inclusion’ weren’t terms yet but in essence that’s what the workshop we were doing would have been called. We’ll use it in our arts, in our medium to help people. We had East Germans and West Germans in the room. We had civilians and military, State Department personnel; a variety of folks who needed to work together very differently. The symbolism of having that conversation and doing that performance in that location was not lost on anybody. During some of the conversation afterwards, one of the young American military personnel, probably not much older than me, stood up in the conversation and he very emotionally, in a very heartrending way said, “I’m just so tired of being trained to hate.” My first response inside was, “I can’t believe something I did up here made him think that out there,” but I wanted to know more. We continued the conversation and even afterwards, he and I went out to get a beer in Munich to talk more. If I look back on my career, that was extremely pivotal point where I realized telling great stories to the world is very interesting but engaging others in their story is far more life giving for who I am and probably a better place for me to spend my career. That began the turning place for me of learning more of the science behind how leaders and organizations work together and how they direct themselves and how they work together. Every day I get to enter the stories of other people and hold those stories with great care and help those leaders in those organizations write the next chapters of their stories in ways they aspire. Telling great stories to the world is very interesting but engaging others in their story is far more life giving. How did you go from that pivotal moment of working in the arts to actually starting a consulting business? It wasn’t quite that direct. I switched careers into learning and development and organization development. Got formal training in that and spent a lot of my career inside organizations early on. I worked for a couple of very large corporations. I learned the hard way in several of those places that being an agent of change inside organizations has a particularly challenging meaning. Ancient wisdom says, “You can’t be a prophet in your own land,” and I continue to be proof of that. My children learned that I was collecting up these wonderful things called severance packages. They knew that that meant more time with dad. What I learned that it meant was it was very difficult to do the kind of courageous change work inside companies. I also started to learn that a severance package inside a company got me well paid outside a company and made the decision then I started my own practice. I sold it to a consulting firm and spent eight years with a wonderful firm in New York City that grew and grew and then sold itself to a very large firm. In those years, I got the amazing experience of working with the most senior leaders, the gatekeepers, of organizations to help them influence great change. When that firm sold itself to a larger firm, the game changed. Now, it was about revenues and profits and leading and managing. A couple of us in that firm were passionate about the work. We love the science of sociotechnical systems and love the science of helping organizations and leaders come together and realize their greatest aspirations. We didn’t love just having to generate revenues and profits and maximize utilization of people. Those are important things to do but it wasn’t what we loved. We thought, “We can still do this. We could still have our dream of the work we love to do. We can go start our own firm.” We left that firm in New York City in 2004 and started Navalent. Thirteen years later, we’re still doing the work we love to do with, often enough, the clients we love to do them with. The firm that you hired way back that you initially sold, how large of a firm was that? How many people have been part of it? That was just me and a couple of friends. It was a small loose practice. After exiting large corporations that you feel more in control of your destiny, you feel like, “Wow.” I also was at a time of my career where if I was honest with myself, I knew I didn’t have 30 more years of expertise to make money. I was doing a classic independent contract job, and it popped a myriad of activities for money. More so I love to do work that I was good at but it wasn’t focused. It wasn’t really deepening my expertise and it was selling to the middle parts of organizations not the top parts of organizations where I really wanted to play. I knew that if I wanted to consult and probably spend my career outside of it, I realized I have a passion for organizations but the best way for me to express that is by not being part of one. I realize I don’t have enough of what that takes for 30 more years of a career. I need to go someplace and get that experience. I need to go and invest myself among people who have done that before. I was in my late 30s at the time. I didn’t want to trust that I could just continue to be a consulting hack for 30 more years and feed my family and save money to retire and buy a home and whatever. It was one of the most difficult, in fact it took a whole year, decisions of my career and proved to be one of the most profound ones and probably the best decision I ever could have made. Choosing to go where I went set me on the path to better do the kind of work I do with the level that my firm does it. With the kind of training and experience and knowledge, I could have never gotten on my own or anywhere else or in an academic program. Right now at Navalent, do you have more than ten employees? What made you or got you to decide that you would go the path of building a firm? You’re a managing partner and owner now at Navalent. Why intentionally build a firm with employees and everything that comes with that as opposed to being Ron Carucci, the solo independent consultant and expert in your domain? What began was a few of us loved working together. We knew that when you love the people you work with, it changes the work. It began as a very small group but we also realized that for us to do the kinds of engagements we want to do, for us to have the impact we want to have, you need to show up to organizations that are large with enough resources to have them be confident you can actually get the work done. We knew there are people out there, practitioners, who loved this work and also wanted to do it as a center plate discipline not a side dish. We began growing. I would be dishonest to say it had a whole lot of deep strategic intentionality behind it. It didn’t. It was organic. It was some trial and error. We’ve had some successes with how we’ve added resources. We’ve had some other places where we’ve been very unsuccessful because we didn’t do a good job. Now, we have a much more robust yearlong onboarding process for our consultants brought by our partners; the middle partners of the firm who lead that. After eleven years, it’s about time. Eleven years with that we’re far more thoughtful and intentional about what it really takes to bring in and help. We’re a virtual firm as many boutique firms are. We’re virtual which is very particular. You have to learn how to not just govern a firm well and create cohesion among a virtual firm but you have to be able to define your standards of practice and define your brand and define what it means to be successful in your firm for your clients. We had to do all that work but once you’ve done all that work, you have to embody it and you have to keep it alive and fresh. The three of us who own Navalent are also practitioners. We love being in the trenches with our clients, a case with every professional services firm. Doing the work and running the firm are two different things and a lot of times the things you do for the firm are just firm citizenship things. You don’t get paid for those. You do it because you love the community you’re with and it needs to be done but there’s not a pot of money that pays you for that. You get paid by your clients. A lot of professional services firm get themselves into trouble when they cut up their compensation system to reward overly individualistic behaviors or reward bureaucratic behaviors. Our compensation model, in a sense, is great client work. I don’t want my consultants sitting in there counting their billings and wondering what they’re going to make that month and all that kind of stuff. I want them exclusively obsessed with helping their clients solve their problems. I have a passion for organizations but the best way for me to express that is by not being part of one. What kind of metric do you use to measure that in terms of compensation based on great client work? It’s an ‘eat what you kill’ model. It’s very aggressive. A lot of your compensation is at risk but it’s a highly billable billing leverage model with very little leverage in it. We don’t leverage our consultants. People are not feeling utilized and used. They’re not feeling like, “My own fate is not in my own hands.” This is the downside about that kind of economic model. The upside for our clients we feel outweighs the limitations of it. Ron, you’ve written several books on leadership. That’s a big, broad topic. 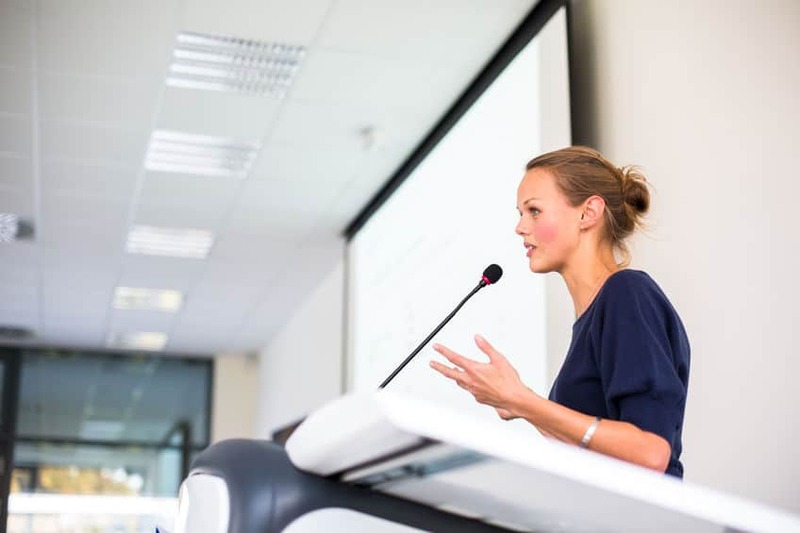 How do you stand out and differentiate yourself and your business when the topic of leadership can apply to so many different things and so many different ways? How do you stand out? My first two books were about how to be a great consultant. That led me after my second book was, “But that consultant to do great work, he still has to have a relationship with a leader. 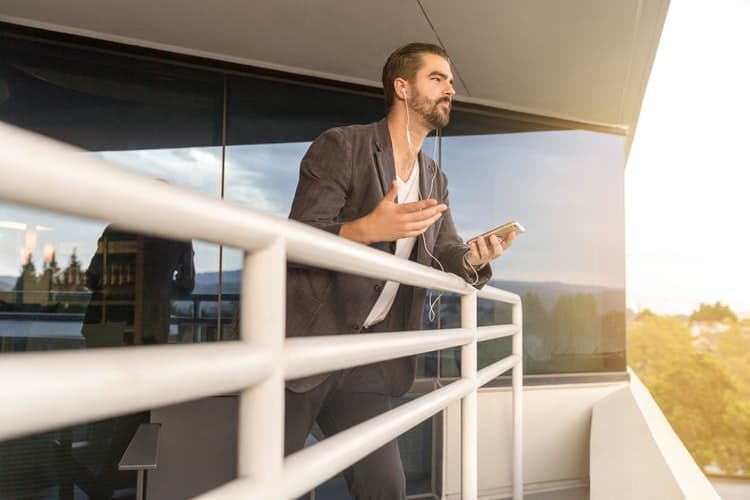 There’s still got to be a connection there.” That’s where I begin to turn my attention to how our lead is leading change, leading impact in their organizations whether they had outside partnership or not. That’s what began me on that journey. It wasn’t like I set out to write about leadership. Research means important data and patterns. We have access to wonderful data because of our diagnostic work. As I have continued to write, I have leveraged the patterns and the broad data sets we have available to us because of our work. When I stumble upon or went headlong into some protracted, intractable problem that client seem to be facing that I don’t have the best answers for, I’m not sure I understand why this keeps happening in these kinds of organizations or these kinds of industries. I want to go find out why. That’s what typically has led to my writing projects. That dataset led to the book Rising to Power to help our aspiring future executives navigate the tumultuous rise and ascent in organizations and thrive once they get to broader assignments. That’s where the material comes from. We use our thought leadership. We use what we see in the world as a way to distinguish ourselves by working hard to write about the things we know our clients care about. Many consulting firms spend time writing about their methodologies or writing about their own case studies to self-promote. It’s a very crowded market out there. It’s a very, very, very cluttered world of people who use the consulting word or hang a shingle out or a small boutique firm. You’ve written for Forbes and Harvard Business Review among others. What kind of impact those articles had on your business? Two years ago, I hired a coach for me for this very question. I didn’t know. I thought I was using thought leadership as a way to distinguish myself and my voice and my firm. It wasn’t working the way I wanted it to work and I didn’t understand why. What I failed to appreciate was how noisy and cluttered and crowded it had become out there and how much it took to set yourself apart, that your ideas and your beliefs and your views on organizational strategic issues could help. I had no idea what I was doing and I hired a coach to help me with that. She’s been extraordinary. What I’ve learned is that if you want to attract a certain kind of client with a certain kind of character or disposition or who wants to solve a certain kind of problem, you have to make sure they can find you. You have to make sure they can have access to your ideas in a way that they can resonate with and go, “That’s the thing I’m struggling with. I wonder if they can help.” You have to put yourself in those places where their decision pathways are, where they’re learning journeys are, where their investigation of how to take on the challenges they’re facing lies and you have to be in that path. I was not. I’m sure there’s a process and a lot behind it, what would be one key principle or idea that people should consider if they want to get their work published, write articles for the likes of Forbes and a Harvard Business Review and other leading publication? What’s really important? Our compensation model, in a sense, is great client work. The first thing is one, have ideas that matter and know that you can codify them well. Certainly have the skill to codify and package them in insightful, pithy way because many people have great ideas. They’re good thinkers but they’re not good writers. Let’s assume you have the base level of capability to package relevant ideas from a client’s perspective, from the challenges they’re facing. From there, there are lots of great channels. You can start with LinkedIn. There’s lots of business publications out there, Inc., Fast Company that will take your submissions. Before you get a regular column like I have at HBR and Forbes, you have to earn your way to do it. This takes discipline. You have to be committed to doing it regularly. You have to be committed to wanting to talk about things and you have to be incredibly patient because it takes a long time before you have enough of a platform. It’s not just about putting ideas out there. You have to have all the machinery in your social media and in your other mechanisms and then your networking of people, people you talk to, to get them to share your ideas. Having the ideas and just codifying them brilliantly is not enough. That was my big problem. I thought I was having good ideas that are interesting and well-documented the world will come to you and that’s so far from the case. I’m glad that you mentioned that the commitment and discipline is important. A lot of times people look at the tactics or some cases, even the strategy but they forget the mindset that is required and the level of discipline and commitment that is the most important before you can even think about the tactic or the strategy. Between the books that you’ve published over the years and the articles that you’ve written, would you say one over the other publishing books versus writing articles and publications has played a bigger role in your business development, in lead generation and growth for the firm? I would add to that as a third pillar is podcasting. This conversation we’re having I probably do ten podcasts a week because it’s a very vibrant medium. It’s a very vibrant place for people who want to consume ideas. I have added a third pillar in addition to the writing medium. I’m also doing this and the speaking. I’m doing two TED events back to back, two weeks apart. These things work in concert with each other. Each stage plays a role. Books are certainly a source of social proof and credibility. Articles are certainly depending where you put them and what you write or something that’s a source of access to a broad thing. If you haven’t got a great Twitter and LinkedIn and Facebook and social media platform on which to help those articles get traction in life, sometimes they get syndicated or a great syndication relationship with folks that will put your pieces in their newsletters and share them or a network of folks is a part of what I spend a lot of time in Forbes doing is interviewing people. 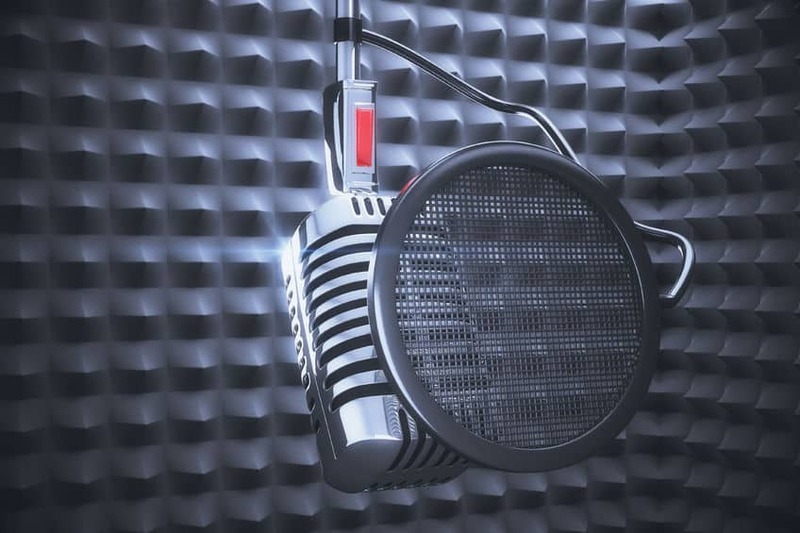 I interview interesting and novel thought leaders to help share their ideas and also get seen as part of their network as well. These are all very interrelated mechanisms that work and each play a different role in ultimately generating leads. Ultimately, you want to have some routine way to begin a conversation with somebody. We also publish a quarterly magazine. We have a monthly collection of our own writing and other people’s writings we share with people. We have a free eBook that allows people to learn about our methodology and all of that to begin curating content that they find useful and curating a conversation with them that eventually makes them want to say, “I know these people could help me.” It’s all part of a much bigger ecosystem of work that starts casting a net very wide and eventually working that net into you to a place where you have an intimate ongoing relationship with folks and eventually, you can create to an offline conversation that eventually, if it proves to be mutually beneficial, becomes the client. In the early days before you were writing all the books and the articles, was there something else you were doing early on in the development of this firm, Navalent, or in your previous firms or experience and career that you found to be effective in generating opportunities to win your business? Prayer helps. At the end of a day, it’s all about relationships. Whether you’re going to go to conferences and network. Most consultants make terrible mistake of assuming that their expertise and their smart solutions are what people want and it’s not. Our research, our very first book, The Value-Creating Consultant, reveal that the primary delivery mechanism of value is the relationship. It’s the attachment you form with clients. It’s the deep levels of trust. Not the manipulative co-dependent relationship that makes you a messiah or an answer ATM but truly a mutually reinforcing partnership. That’s the vehicle on which your expertise must be conveyed. Too many consultants lead with answers instead of relationship. However you form those relationships and whatever vehicle you find yourself in, for so long, demand creation wasn’t the muscle it should have been for Navalent and we’re paying a price for that. We’re having to catch up because our networks and relationships were so strong and so good. Our clients will leave one company, go to another and take us with them. We had plenty of referrals and plenty of repeat business because we worked so hard to be so good and our clients truly valued their relationship with us. While that was a great asset for us, it wasn’t building the asset to replicate it. Later in life, as our clients retired or moved on to places where they didn’t need our help anymore, we didn’t have a muscle to do that. The last three or four years, we’ve been working very hard to build our demand creation muscle so that we can get out there and help the kinds of people we know we can serve best find us. What does that look like when you say building the demand creation muscle for your firm? What kind of steps are you taking? We started the magazine. We started building our social media platform. We’re speaking with more discipline or hosting breakfasts. We’re curating conversations in communities of people coming to us. I’m writing for Forbes and HBR and our books, doing podcasts. It’s that work but it’s not just every now and then. It’s a disciplined weekly, monthly, quarterly rhythm we have. By no means I should tell you that we’re good at it but then there’s a whole bunch of analytics that come with it. We have Leadfeeder, MailChimp and a bunch of very sophisticated devices that we’re still ancient. We are still not as sophisticated as we could be to understand what that data is telling us and where we should direct our efforts and how we should go find people who seem like they could be great partners for us. We’re still learning after two years. It’s a four to five-year journey of getting that machinery in place. They tell you that. For eighteen months, you won’t even see an inquiry. We got our first one who did become our client within twelve or thirteen months depending on what your expertise is. Ours is a very niche expertise so it’s a little bit higher bar for us. If you want to attract a certain kind of client, you have to make sure they can find you. How do you develop that discipline? What steps are we taking in or what mindsets or what choices or what does influence that level of discipline? A lot of people want the result but they’re not prepared to make the commitment. Even if they say that they are initially, they don’t carry it through. In your case you’ve clearly thought this out very well, you’ve been working through it. What has fostered that level of discipline that you now have? Desperation. You’re being kind and assuming that the discipline was always there, it was not. We dabbled. It was a hobby for us but we had such a great network of clients that we didn’t have to be disciplined. We have our debates in our firm about demand creation work. Earlier efforts to go sponsor a conference or do others, one of those speed dating. It’s terrible. We dabbled at best but about two and half years ago, we got serious. We had more of our risk exposed with too much work with too few clients and we knew that was dangerous and sure enough that proved to be true. For me, I found myself taking on clients in my heart of hearts I knew I shouldn’t take on. I thought, “I’m too far into my career now. I don’t want to work with sociopaths anymore.” I want to work with good leaders and smart leaders and flawed but people who care about their organizations. I don’t want to work with sociopathic people but for some reason, the ones I want to work with are not finding me. The sociopaths are. I don’t know what that says. If I don’t do something different, it’s not going to change. I’m smart enough to take that part of my own medicine. I say that to my clients all the time. I also knew that everything I was doing seemed to be spectacularly ineffective and so I hired a coach. I went and found somebody whose expertise is this. She has been brilliant and helped me realize that not only was I not doing the things I should be doing. I wasn’t even in the right galaxy. I wasn’t even close. I had great content and great ideas. One of her opening parts of her diagnostic to me was, “If you set out to be the best kept secret in consulting, you’ve done a great job.” I had no idea. It never would have occurred to me to write for Forbes or for HBR. You have to learn. These are muscles especially if you’re a consultant that’s in your late 40’s or 50’s or you grew up in a very different era of consulting or you grew up in a consulting firm. These were never requirements. Demand creation this way was never a requirement. If you’re a niche firm, you’re not going to pay to advertise. You’re not going to pay all kinds of money to put out ads. 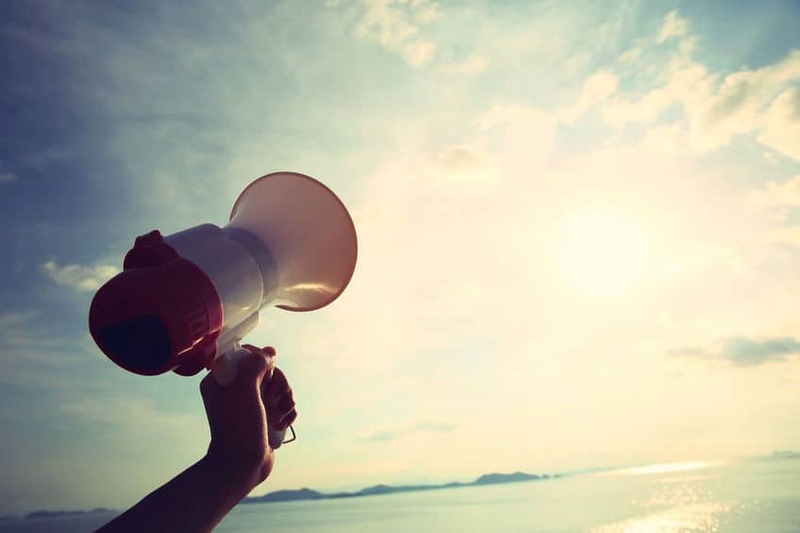 You have limited resources with which to invest to get your message and your presence out there. For us, the digital world became a great option. It’s not free. There is money involved. I’m not going to put a Navalent billboard next to Sapient or Accenture. We’re not that. Finding the ways in which we could build a platform of exposure but you also have to accept the very difficult journey that you’re going to put a bunch of content out there and three months later, you’re going to have twenty new clients. You have to be disciplined and patient, both of which have been challenged in my firm at any given time. We’re seeing fruit, we’re seeing early evidence that it’s effective and we’re seeing the evidence of work. Do I have 30 inquiries a week? No. Will I one day? Maybe. I don’t need 30 but 10 or 12 a month will be perfect for my size firm. High-quality inquiries, I don’t want just somebody who’s saying, “Can you come to my offsite? Or “Can you come and speak at my sales meeting?” I want meaningful questions about the kinds of problems we are good at solving. For many, I find people that exhausting and they don’t want to learn. It’s too intimidating. It’s too late in their career to start. They want to hire and outsource it which you can do but you have to be that committed to this work. As my coach says, “Too many die in Heartbreak Hill halfway up because they just give up.” I’ve got an article on my LinkedIn profile called The Challenges of Learning to be a Thought Leader are Different than you Think. It’s about my relationship with my coach. I was very vulnerable and saying, “If you’re going to start down this path, good for you. Here’s what you can expect because it’s not easy.” It’s well worth it but it’s not easy. We’re on such an important message that you’re sharing. It’s a real message, a real conversation that may not be easy for some people to hear but for everyone, give some thought to what Ron is sharing. It’s not creating meaningful results and what I like to call meaningful success doesn’t always come simply by doing things that are easy. Quite often, it comes from being very committed, very dedicated, decisive and then working hard at it consistently. You’ve really shared a great example of that, Ron, thank you so much. Ron, what’s the best way for people to learn more about your work and to connect with you? Our website, www.Navalent.com, got all kinds of resources, articles on our work, on our methodologies. 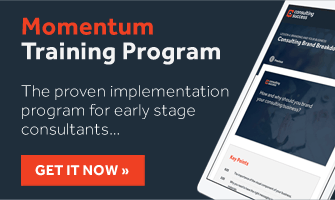 If you come to Navalent.com/Transformation, you can get our free eBook on Leading Transformation in Organizations. I would love to share that with you. Get our quarterly magazine called The Navalent Quarterly which has great articles about our clients and case studies and thoughts we’re having about different themes. We’re doing a great virtual summit in March called Leading Through Turbulence with a wonderful lineup of speaker: Jon Haidt and Dan Pink and Nilofer Merchant and Scott Anthony and Dorie Clark and a bunch of executives who have led their turbulence. It’s a wonderful collection of content where we’ll be curating in that week. It’s in early March. Virtual summits, another example of demand creation. We’re doing that to build our set of friendships out there in the world. I would love to keep the conversation going. Find me on Twitter @RonCarucci, also on LinkedIn. The primary delivery mechanism of value is the relationship. Thank you so much for coming on here and sharing your story and methods. I really appreciate.